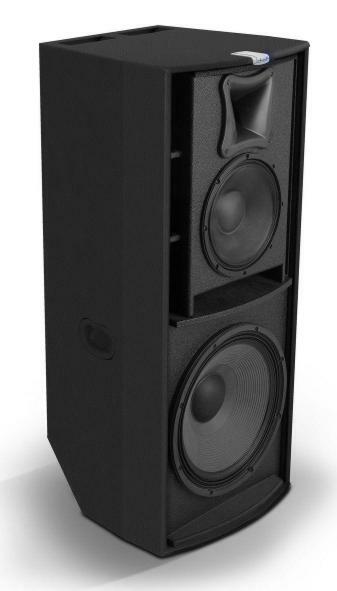 Introducing a new addition to its Joker series, Master Audio launches the compact, self-contained JK318A 3-way sound reinforcement loudspeaker system which combines 18", 12" and 1"inch drivers for full-frequency sound reproduction. The JK318A is a single-box approach to full-frequency sound with best in size/performance ratio from a compact and lightweight (59kg) system. Within a 1240 x 534 x 524mm footprint, the cabinet packs an 18-inch neodymium woofer with four-inch voice coil for low-end, a 12-inch neodymium driver with three-inch voice coil for mids and a 1.75-inch PET diaphragm neodymium driver for high frequencies, making it a true three–way loudspeaker that reproduces the full acoustic spectrum from 35Hz to 19kHz, with a continuous output level of up to 132dB at one-metre. Master Audio claim the JK318A to be the only 'all-in-one' loudspeaker on the market that concentrates this level of power and audio quality inside such modest dimensions. Practical, simplistic in use and resilient, the cabinet delivers a total of 3,000 Watts (2,400W low plus 600W mid/high) of completely self-powered gain, after a minimum of setup time. The JK318A's amplifiers, with switching power supply, are matched to digital electronics featuring 48-bit DSP architecture and 24-bit/48kHz analogue converters providing low frequency control and mid-bass vocal performance, while the output of the HF driver remains unimpaired even at very high levels. Thanks to its asymmetrical horn, the JK318A offers a flexible dispersion pattern for excellent coverage, both in the wide, short throw zone and the narrow, long throw zone. The cabinet features an extremely high resistance Polyurea coating to protect it from impact damage – scratches or abrasions – and moisture during use, while the proprietary round grid pattern grille, fashioned from 1.5mm steel, provides heavy-duty protection to internal components while remaining acoustically transparent. Master Audio CEO Juan Amate, who devised the JK318A and closely supervised its development process, commented: "The JK318A represents a natural evolution of the classic 2x15" that was commonplace during the 80s and 90s, but which doesn't quite meet the full-frequency reproduction demanded from today's small-format PA. Of course, this need can still be served by a passive two-way system with external amps, electronics and sub, but we've taken all this power and more, squeezed it into a single, compact and lightweight cabinet, and tailored each and every component so it works in perfect harmony with the next – it really is something to see and hear."